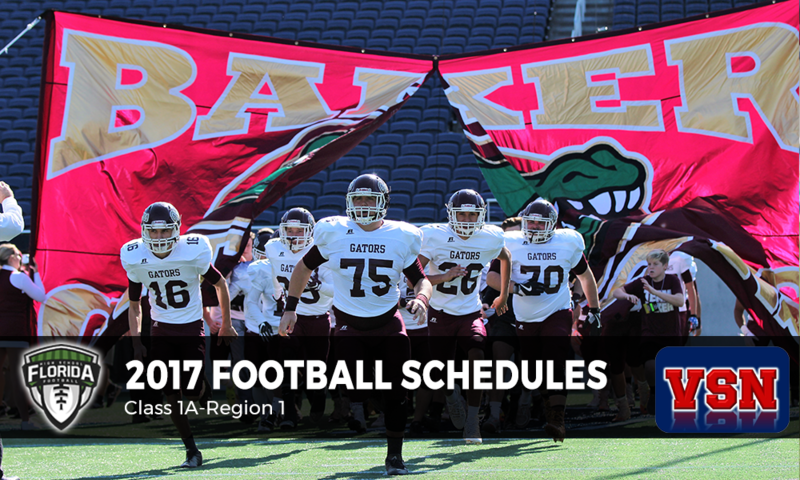 Here are the 2017 football schedules for Class 1A-Region 1, Presented by Varsity Sports Network. All kickoff times are 7:00 p.m. Central unless noted. • Week 3 — Fri. Sep. 8 — Snook Christian, Ala.
• Week 8 — Fri. Oct. 13 — @ Snook Christian, Ala.
• Week 3 — Fri. Sep. 8 — Autauga Academy, Ala.
• Week 1 — Fri. Aug. 25 — @ Flomaton, Ala.
• Week 9 — Fri. Oct. 20 — Blacksher, Ala.
• Week 1 — Fri. Aug. 25 — Blacksher, Ala.
• Week 2 — Fri. Sep. 1 — @ Escambia Academy, Ala.
• Week 11 — Fri. Nov. 3 — Snook Christian, Ala.